Diane Loomis: New England quilt artist, teacher, lecturer, and award winning heirloom machine quilter. I hope you enjoy browsing my website. Please check back often for new quilts, more photos and updated workshop information. And visit my blog, too! To find out more about where I am and to see what I am currently quilting - visit my blog at http://dianeloomisquilts.wordpress.com/ Subscribe so you'll never miss a new post! Leave me a comment to tell me what you think -- I'd love to hear from you. My traditional Amish quilt Five Bar Blues is a finalist and and award winner and was exhibited at the 2012 Houston International Quilt Festival. I am proud that 2012 was the second year in a row that I had a winning quilt exhibited in Houston. Five Bar Blues is currently on display at the Texas Quilt Museum in their spring exhibit called'Winning Quilts" - Top Quilts from the International Quilt Association's 2012 Judged Show. This exhibit will be available through March 31, 2013, so if you are in the area, be sure to visit this museum. My 2013 schedule of workshops and lectures has been updated! I still have openings for workshops and lectures in 2013 (summer) - please contact me for additional information. I'm updating my Workshops page with new information for 2013 A new downloadable tri-fold brochure that you can view and print is available on the Teaching page. There will be more quilt photos in the Quilt Gallery, so visit and check out the new quilts! Or visit Diane's Quilt Index where you can see thumbnails that link to all the quilts. 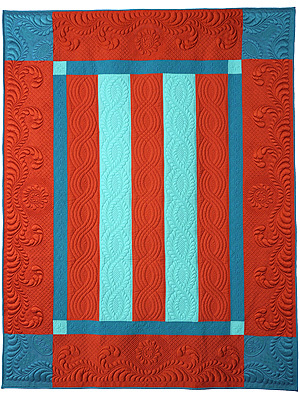 Check out my Guest Tutorial for the 2012 FMQ Challenge! 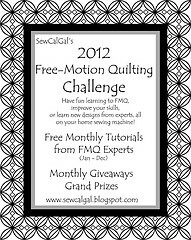 I was thrilled when SewCalGal asked me to be one of her FMQ Experts and to contribute a Bonus Tutorial for the 2012 Free-Motion Quilting Challenge. The tutorial has step-by-step instructions for simple machine trapunto - one of my favorite quilting techniques - and is now available on SewCalGal's 2012 FMQ Challenge page. Check out the tutorial and join the conversation at the 2012 FMQ Challenge page or on SewCalGal's Facebook group. I participated in the Silver Threads Quilt Challenge to celebrate the 25th anniversary of the New England Quilt Museum. The Silver Thread Challenge quilt entries were unveiled in a special exhibit at the 2012 Lowell Quilt Festival. If you missed the quilt show in Lowell this summer, the Silver Threads Challenge collections will be on display at the New England Quilt Museum from October 17 through December, 2012. 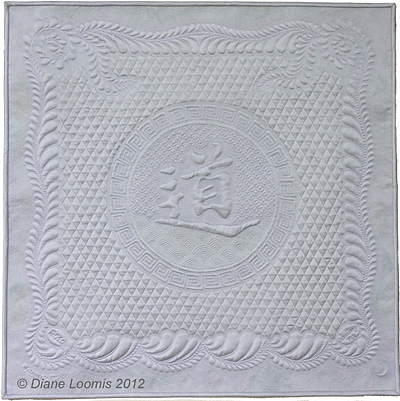 My Silver Threads quilt 'Reflections of Tao' is in the exhibit. It is a wholecloth quilt made of silver silk blend sateen fabric, and machine quilted with many shades of silver and other colors of silk thread. 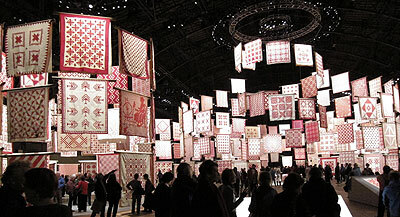 From March 25 through March 30, 2011, a remarkable exhibit of 650 antique red and white quilts was displayed at the Park Avenue Armory in New York City. This was one of the ‘Year of the Quilt’ exhibits sponsored by the American Folk Art Museum, and was free to the public for 6 days in March. I was in the right place at the right time and spent most of a full day overwhelmed and exhilarated by this show. I took over 400 photographs, and wish I'd taken more! If you weren't able to see the exhibit, check out the slide show on my site under the Favorites / Photos link at the top, or click on the red and white photographs below! In the spring of 2009, the New England Quilt Museum featured a selection of my quilts in the Museum Shop. If you were unable to visit the museum in Lowell, Massachusetts to see my work while I was the Featured Artist at the Museum, please visit my first blog entry where I have posted a few photos of the exhibit.